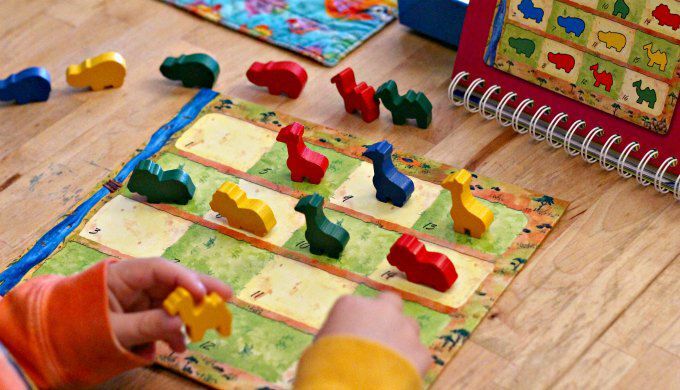 We’ve owned AnimaLogic for years now, and this solitary logic game from Fat Brain Toys is one that has served us well. It brilliantly exercises the kids’ thinking skills. 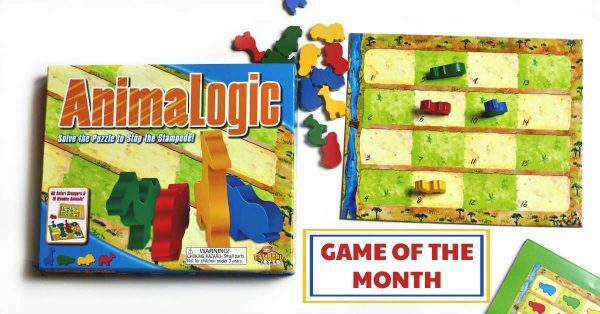 A number of our recent selections for the game of the month feature have been strategy and logic games, and like them, AnimaLogic is based around solving sequence puzzles according to a set of predetermined rules. 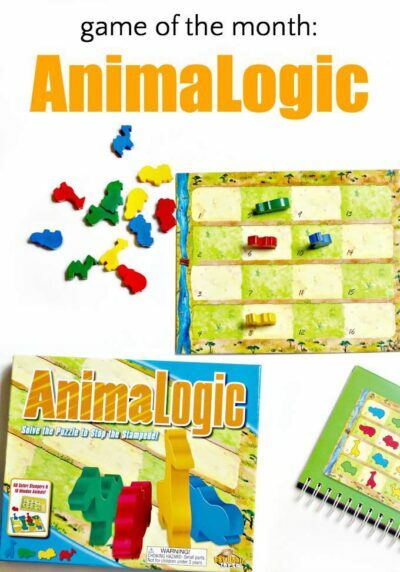 AnimaLogic consists of a small game board, animal pieces in four colors and a booklet of challenges. The animal pieces are wood, not plastic, and are very satisfying to hold! The challenge booklet contains puzzles from beginning to expert level. Each challenge page instructs the player how to set up the animals on the board. The objective is to move the animals across the river, and thus off the game board. However, the animals can only move sequentially and in accordance with a set of rules. For example, they can only move one at a time, and must follow either an animal of the same type or color, etc. Since AnimaLogic is a single player strategy game, parents can revel in the quiet hours that their independent-minded kids spend working through the challenge booklet! There are 5 challenge levels so the game grows with the child. Whoot! Whoot! Younger kids will enjoy playing with a grown-up nearby to offer suggestions when they get stuck. I would encourage you to ask kids questions about what they see on the board, rather than simply giving them the next move. And honestly, sometimes I can’t see the next move myself, but the kids figure it out! I have one kid who is naturally drawn to these types of games and he plays quietly by himself. My other son needs an adult to sit alongside him to give hints or suggestions. Having experience with both types of kids I can confidently say that this game is extremely valuable for encouraging kids to see the value of perseverance. AnimaLogic requires kids to have patience and engage with their brains! While playing, they are exercising skills that they will put to use in math, scientific inquiry, and engineering. Like other games of this type, the practice they get is particularly useful for learning coding skills. But not just that, getting all the animals across the river gives them a boost of self-confidence and sense of accomplishment! This is certainly one of my top recommendations for games to have in your collection. Subscribe to our newsletter to stay abreast of all our favorite games. You will also get the inside scoop on our favorite books and other thinking activities.